Specialty: What else? Corn dogs! A favorite treat at carnivals and fairs across the country, the corn dog is a staple product at most of these types of places, but what is it like at the Disneyland Resort? In a word, “yummy.” Both Disneyland and Disney California Adventure have a corn dog location and both are popular, but only in Disney California Adventure can you find the variety at Corn Dog Castle! Read about Disneyland’s Little Red Wagon Corn Dogs on this blog post and find out about other hidden food treasures. Space being an issue, the Little Red Wagon in Disneyland only serves the classic corn dog (and good it is! 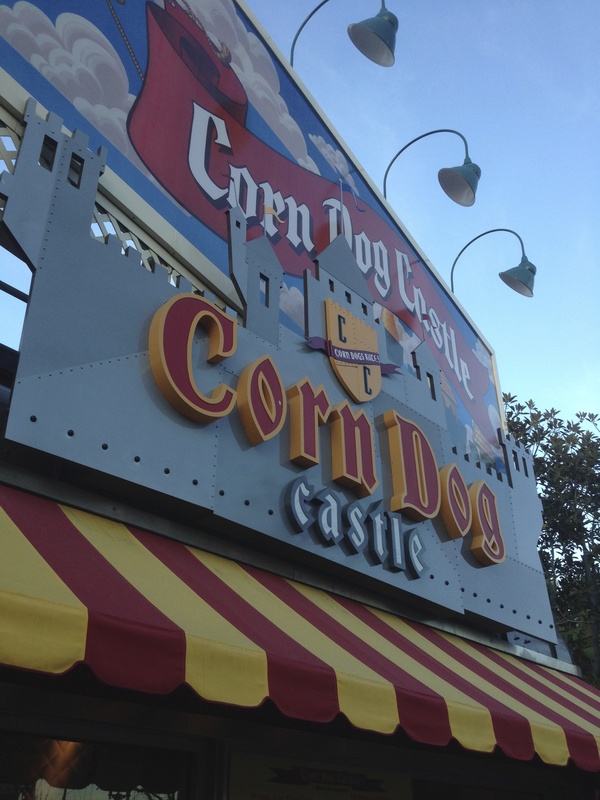 ), but with the added space at Disney California Adventure, Corn Dog Castle can feature more varieties. They have the regular (chicken and beef filled) corn dog, the deep fried cheese stick (cheddar cheese), and the hot link corn dog. The hot link corn dog isn’t incredibly spicy, but it has a nice kick to it. According to the Disney blog, the regular corn dog is still the favorite of the people, but if you are looking for something maybe a little different try the hot link one. Each corn dog comes with either sliced apples or a small bag of chips. Even with all of the recent changes to Disney California Adventure and the major redesign of Paradise Pier, Corn Dog Castle still fits in nicely. A staple product at seaside pier attractions, people expect to see fare like the corn dog available. Located between Goofy’s Sky School and Ariel’s Undersea Adventure, you’ll find it across from the Jumpin’ Jellyfish. There’s something special about the corn dogs at Disneyland that make it taste better than the average corn dog at the fair. The batter that surrounds the hot dog has a sweet (but not overly sweet) taste to it that compliments the savory juicy flavor of the dog. It’s also nice that they don’t overly batter the corn dog. Some places tend to saturate the dog with batter which makes it taste almost completely of bread and you miss the “dog” in the corn dog. Other places use a fairly weak “dog” and it’s either too thin or too tiny to be of any substance. The Disneyland resort corn dogs strike a perfect balance between the two. Just the right amount of batter and dog to make it tasty. And the fact that they make them fresh and regularly insures that your dog is hot and crispy without having been under a heat lamp all day long. An added feature of the corn dog is that it’s good walking food (although admittedly the bag of chips or fruit make it a little unwieldy). Take it in line with you and munch on it while waiting to get on your favorite ride. If you haven’t tried one yet, treat yourself next time you go to the parks. And have it with mustard. Yum. Oh wow, I haven’t eaten here in a long time! But we always pass it on the way to Boardwalk Pizza and Pasta, which for some reason is where we always end up eating. I want to try that deep fried cheese stick! Previous Previous post: How Frozen Warmed My Heart – Frozen Sing-A-Long at the El Capitan Jan 31-Feb 13!